Update #3, January 9th, 2016: The testimonials on the landing pages have now been updated with genuine comments and images from Second Life users. Update #2: I’ve further been informed that the testimonials are intended to the express the sentiments of SL users and are based upon feedback. expressed by SL users. Similarly, the images are in fact stock Internet images. A footnote to the effect that “The consumers above are not actual consumers of the advertised product.” has now been added to each of the landing pages. Update #1: I’ve been informed by various third parties that the testimonials on the landing pages may not in fact be genuine. I’ve therefore revised this post until I hear further on this matter. 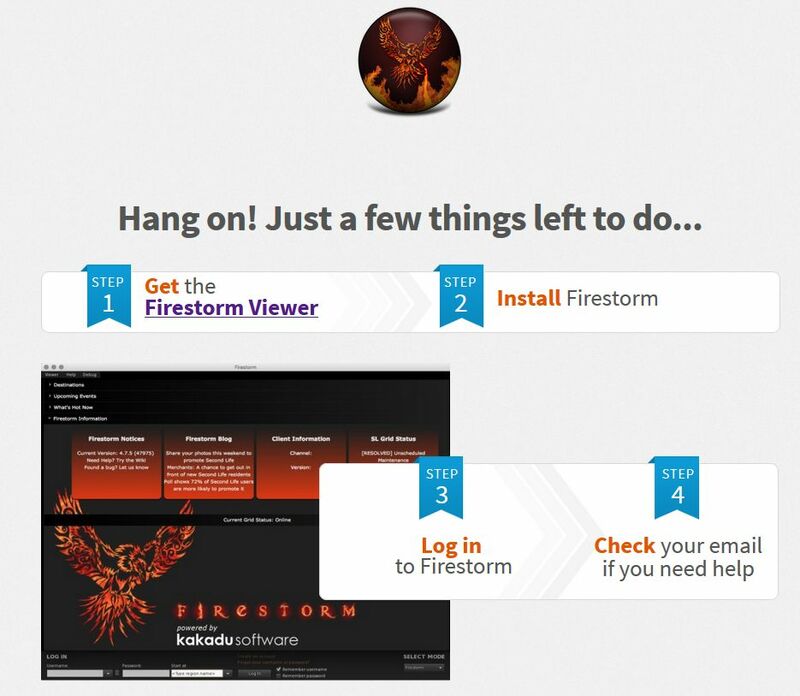 On Monday, December 28th, Friestorm announced the arrival of their Gateway landing pages, and asked Firestom users for their assistance in helping to spread the word about Second Life. The Landing pages are an integral part of the Firestorm Gateway, which itself forms a part of the upcoming trail Gateways Programme I previewed back in September, and which hopefully will be officially announced as up and running by the Lab in the near future. While one might quibble over the subject titles (role-play and exploring might seem to exhibit a high degree of cross-over, for example), the pages themselves offer a crisp, clean approach to present Second Life, including endorsements from (and photos of) actual SL users. Each of the pages includes a series of sign-up buttons which carry those interested to the initial phase of sign-up: creating an account – providing a user name, etc. It’s probably worth pointing out here, and before the conspiracy theorists reach for their tin-foil hats, that this sign-up process uses an API supplied by Linden Lab. This means that, just like all third-party TPVs, none of the gateways in the programme – Firestorm or anyone else – is storing or accessing the sign-up information a new user provides. The information is strictly between the user and the Lab. The only part of the sign-up information which can be accessed is the e-mail address: and that only for as long as it takes for an automated welcoming e-mail to be sent. Providing the fields are correctly filled-out – error messages will be displayed at the foot of the input fields, although you may have to use the vertical slider to bring them into view thanks to the API – clicking Get Started will move you on to the next page, intended to step the user through downloading, installing and launching the viewer. To me, this page presents some issues which perhaps need to be dealt with if it is to be as effective as might be hoped – I’ll come back to this a little later. One thing established SL users are bound to note is that nowhere is there any opportunity for the new user to select an avatar. This isn’t an oversight on the part of the Firestorm team – it is a result of having to use the “old” user sign-up API, which doesn’t have any hooks into the Avatar Picker seen on the Lab’s own sign-up pages. Thus, the first opportunity new users get to picker the gender of their avatar is after they have logged-in – and even then, they only initially get either the male or female default Character Test avatars which (a long while ago) replaced the infamous “Ruth”. Obviously, this is far from ideal. First impressions count, and many people seeing their avatar for the first time and comparing it to the glossy images on the landing pages could end up feeling a tad bit aggrieved or disappointed and might even simply log off. This issue has already been raised with the Lab, so hopefully, something can be done about it, either by providing the updated API with the avatar picker to those involved in the gateway programme, or by the Lab finding the means to present new users coming into SL via these gateways with at least one of the new “Classic” avatars instead of the Character Test versions. Once they have selected their gender and have seen their avatar appear, the new user will find they’re starting at the start of the Firestorm’s orientation island, where they can start learning to use the viewer, before progressing on to finding out more about Second life in general through the various activities and events operating within the Firestorm gateway regions. Given that new users are confronted with the Character Test avatars on first logging in (and allowing for the fact this will hopefully be changing), I did find myself wondering if a short lesson couldn’t be provided showing the new user how to access the Avatar Picker and quickly create an alternative look, just to reassure them that avatars in SL really don’t all look like they first see themselves. As noted, the landing pages themselves are a clean, fast-loading design which, while echoing some of the approach taken by the Lab with their own focused landing pages, do not simply ape them. However, and more generally, I do feel there are some issues with the approach which need to be addressed. Currently, the thrust of the Firestorm marketing campaign has been directed towards leveraging current users and asking them to help bring family, friends, etc., into SL. There’s actually nothing wrong with this per se, other than the potential well of new users is limited: even with the promise of anonymity, many people aren’t comfortable with sharing their interest in Second Life with those around them. Doubtless, the Firestorm team are aware of this, and have plans to make the campaign more broad-based, possibly by presenting the landing pages, etc., through a high-level portal-style web presence. If this is the case, then I would strongly advise them to re-think the “Firestorm” page of the sign-up process, which as I noted above appears to be the weak link in the chain. 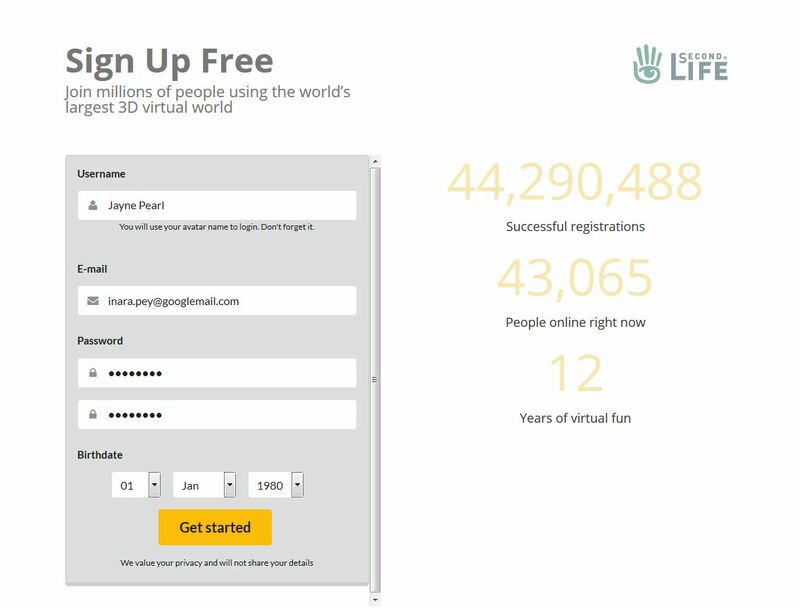 The first two pages in the sign-up process clearly bear the Second Life logo and reference Second Life throughout. However, with the viewer download page, all this is gone: the new user is suddenly confronted with being told to download and install something called “Firestorm”, with absolutely no explanation as to what it is, what it does, why they need it, etc. This perhaps isn’t too much of a problem where the new user is being guided to SL through the encouragement of an existing user (as per the current focus of the Firestorm campaign), but it does run the risk of failing badly were it to be presented to the world at large through a website or portal, where incoming new users don’t necessarily have access to knowledgeable support, and the switch from a focus on “Second Life” to something called “Firestorm” without any explanations why, might be seen as suspicious. This is especially important when one considers the Lab’s own data shows that while new users complete the first steps of the sign-up process, many do turn away when asked to download and install the viewer. Thus, making it clear what “Firestorm” is and why it is needed would seem to be key to encouraging new users to continue. My only other question mark with the landing pages is the lack of any reference towards Linden Lab, or links to either the official SL website, the Terms of Service, reference to the Lab’s copyright, or the Lab’s corporate website. It may be felt that these could be confusing to the new user, or that the Lab are OK with Second Life being presented almost as a white label platform. However, for my part, I’d prefer to err on the side of caution and include them in the interests of full transparency with incoming new users. If I’m honest, I’m still in two minds about the gateway programme. On the one hand, there is like data to show the “old” programme – with one or two notable exceptions – was really that successful in bringing new users into Second Life, nor did the A/B testing carried out in 2015 comparing the likes of the Firestorm new user orientation process with that offered by the Lab. On the other hand, however, it cannot be denied that the more pathways which are provided to led new users into Second Life, the greater the potential for more of them to be retained as engaged users. As such, I’ll be continuing to watch the Firestorm gateway with interest – and others as well, as they (hopefully) start to appear. I went through this last night and agree with your comments. Of special annoyance is the sign-up api, even I did not initially notice the “name unavailable” below the bottom of the window, everything I had entered just vanished. Also, why did *everything* vanish, surely I should not have to fill in the whole thing with each try to find a unique name! For me the page for downloading Firestorm did not even load, perhaps it knew I already had it on my machine? I see this as a step in the right direction, although as you point out it depends greatly on getting those links out to an as yet unreached audience. It did for me – and I currently have 3 versions of Firestorm installed! 🙂 . One thing I did when I first signed up thinking I would not be here long was not create a meaningful name to for my username. So now I have a name that I don’t like and it is viewed by many because many use legacy name view over display name. Some emphasis should be placed on this to new users. As in other virtual worlds you can change your legacy name without creating a new avatar. The other thing I noticed with this is knowing that it is for recruiting new subscribers it should also address already users that are roaming around not knowing how to find the thing that interest them. So perhaps an additional button for Already a members would bring people to these gateways so that their experience with Firestorm can be enhanced. I think its critically important that the avatar selection can be made BEFORE first login. As you and others have said first impressions are important, and a decent visual modern style avatar with pre-selected gender (or robot or animal which ought to be brought back) and visually impressive initial landing location that is also not overwhelming ought to be offered. Hopefully, this is what we’ll get, assuming the Lab can make the updated API available to the new gateways. It’s purely an assumption on my part, but I wonder if it trying to make it available which has contributed to the delay in the programme being launched. Honestly, I wish they would not call it Avatar name and would instead call it username. It’s time to relegate user names to the purpose they should be used for, differentiating accounts. Make display names the actual Avatar Name. Just back from FS Orientation island, creating a NC of picky feedback. The FS people there made it clear that they are still working on things. My suggestion is, if you care, provide feedback now instead of complaining later. Yup… Always provide feedback to the folk. Did that with Jessica yesterday 🙂 . Here’s hoping the issues get worked out, and FS’s efforts aren’t just preaching to the choir. SOooooo when I meet a Jayne Pearl in-world it is really you I guess? That was a first, random attempt (the birth date isn’t even mine & the e-mail address is all but defunct – as you know, I’ve been a GMX user for the past few years). I was testing to see if any message would prompt for the use of spaces in a name & just opted to grab this shot. I did create a new avatar using the correct format, but that one is unlikely ever to be used again. You have many good points, Inara. I wonder if FS team can modify the viewer in a way that it would pop-up the avatar selection floater (the one always available inside the viewer), instead of the male or female selection dialog.